1. Use lump charcoal instead of briquettes. It gets ready to cook on much faster and burns at a higher temperature as well. 2. Use wood on top of your coals. I buy bags of hickory, apple, and mesquite chunks and cut them down into smaller thumb sized pieces. When the coals are ready to cook on, I put the wood on top, let them catch fire, and put my meat right over top of the fire. Another tip is to take a hair dryer and blow directly on the coals - you will notice when you turn it off the fire will flare up. Use this to your advantage and turn the hair dryer on and off to keep the fire blazing hot. This way you can get a nice char on the outside and still be rare or medium rare on the inside. 3. 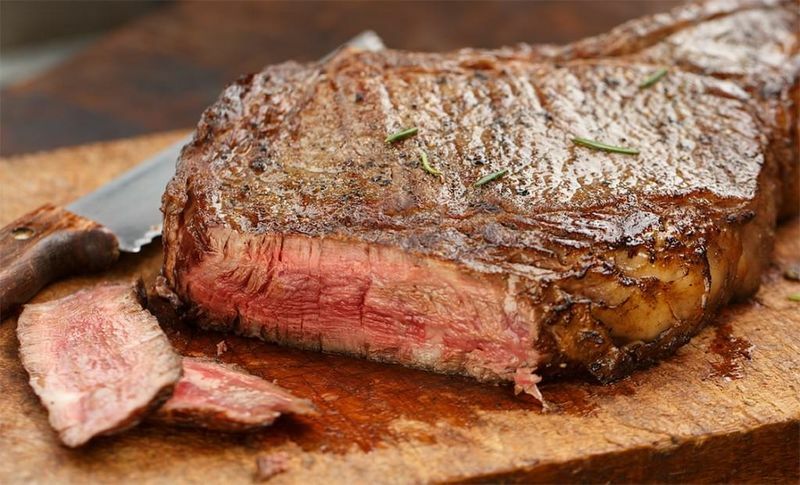 Instead of buying a steak for each person, buy a few big fat steaks. Cook them whole and then carve them for serving. I think you will find you get a better, more impressive end product. 4. Please note that with this next tip, your steak goes in this AFTER it’s been grilled. Before you put your steak on the fire get out a baking dish large enough to hold your steaks. Chop a blend of garlic and fresh herbs, such as rosemary, sage, peppercorns, and thyme (from your herb garden). Add olive oil and balsamic vinegar to cover the bottom of the dish. When you pull your steak off the grill, put it in this dish and coat both sides. Let your steak rest in this marinade for several minutes, flipping half way through. 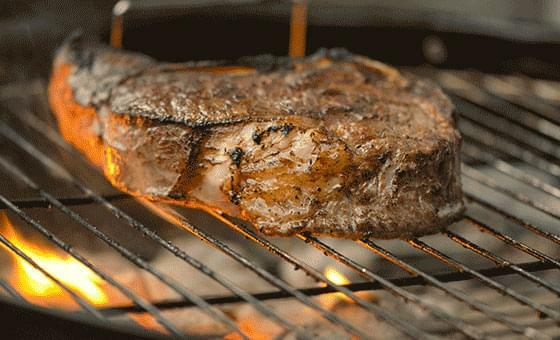 It will soak into the crust of your steak and make it explode with flavor. Just like when you cook a turkey, this resting period allows the juices to reabsorb into the meat so they don’t bleed out when you carve it, keeping it moist. Serve the remaining marinade with bread for dipping. My favorite steak without question RIBEYE! My wine paring red zinfandel (try Rombauer) or a big cabernet. Thanks Jay! I'm getting Hungry! !